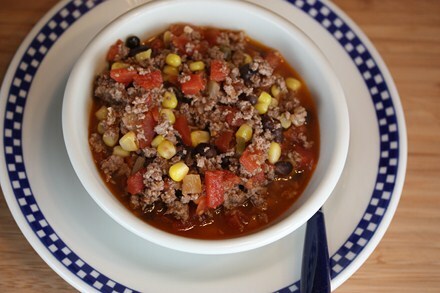 Today’s soup for Souper Monday is similar to a taco soup, but it is a richer and heartier soup. It is really more of a ground beef stew with a taco/southwest type flavor. In a large pan brown ground beef and drain off any fat. Add remaining ingredients, except cheese, and stir well. Cook over medium low heat for about 20 minutes. Serve in bowls garnished with cheese. 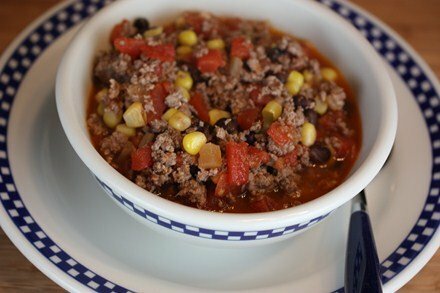 Is your Southwest Beef Stew Gluten Free? It looks yummy! Yes, all the ingredients in this are gluten free. I always check labels to be sure, but as long as you do that you should be fine. I made this tonight for dinner and it was wonderful! The flavors blended together so nicely and it was a quick meal since I used pre-cooked frozen ground been that I hand on hand. I served it with a little cheese and a few chips. Yummy!